You are currently browsing articles tagged aviation. Recently logged some aero activity on 6631 kHz from Eastern Russia. This is one of the RDARA (Regional and Domestic Air Route Area) used by Petropavlovsk ACC. They were working a couple United flights both reporting at position BUMEN out over the Sea of Okhotsk, flying eastbound towards SENOR, right near the Kamchatka peninsula. 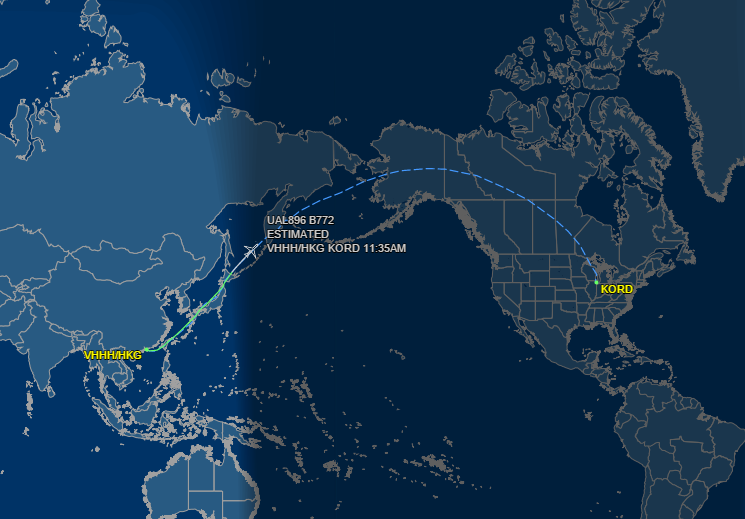 Screenshot from Flightaware showing the approximate position of United 896. And as usual, here is an audio clip of United 896 and United 110 in comms with Petropavlovsk Control for your enjoyment. With President Obama heading over to South Korea for an international nuclear summit I figured it would be a good opportunity to try and catch Air Force 1 on the MWARA HF frequencies. Not knowing their exact route it was the matter of guessing on the frequencies to monitor, therefore I parked radios on 5667 kHz for Tokyo Radio and another on 6655 kHz for San Francisco Radio and hoped for the best. Well….Got lucky this time around! Just before 1400 UTC Air Force 1 came up on 6655 kHz USB to give position and request selcal check from San Francisco Radio. He reported CPDLC on R580 at FL320 with a destination of RKSO (Osan Air Base). At 165E they would be handed over to Tokyo Radio, however by this time the sun was rising and reception to the far east was beginning to diminish. Here is the recording of Air Force 1 and San Francisco Radio in comms. Here is audio clip of the transmission. The past few mornings I have been hearing aero comms on 10072 kHz in USB mode between Seoul Radio and various South Korea based airlines. Today I logged Asiana 105, Asiana 733 and Jeju Airlines 2201 all wkg Seoul Radio. Did some checking on Google and discovered a few other published frequencies that include: 4687, 13333, 17916 and 21970 kHz. I will certainly keep an eye on these frequencies and report my findings. Nadi ACC on 5643 kHz with a fantastic signal this morning. 5643 is a MWARA South Pacific (SP-6) frequency. Other MWARA frequencies used by Nadi include: 3467, 8867, 13261 and 17904 kHz. From California the best time to monitor is during the night and early morning hours. The MWARA SP-6 group is also used by San Francisco OACC, Brisbane ACC, Auckland OACC and Tahiti OACC. Nice reception into Africa this evening on 5565 kHz from Luanda ACC. This is a MWARA frequency for the South Atlantic Ocean (SAT-2). Attached is an audio clip of Luanda wkg KLM 598, a Boeing 777-200 en route from Cape Town to Amsterdam. It’s always a thrill to receive African stations here in California. Ever tuned the HF aeronautical bands and stumbled across automated voice broadcasting weather info for various cities? If so, then you most likely heard a VOLMET station. VOLMET, or meteorological information for aircraft in flight, is the term applied to a worldwide network of radio stations that broadcast TAF, SIGMET and METAR reports on shortwave frequencies. In addition to helping pilots find weather at airports, these stations are a great resource for SWL listeners to check propagation conditions to various parts of the world. Posted below is my collection of audio clips for Volmet stations that have been monitored at my location in Southern California. See the DX Info Centre for a complete list of frequencies and schedules for VOLMET stations. Magadan Area Control Center works flights on polar routes, often handed over from Gander. Magadan Radio can normally be heard on 4712, 8837 and 11390 kHz during the overnight hours from the Western USA. Other published frequencies include: 6585, 13265 and 15030 kHz. Unfortunately the aircraft are just out of my reception range given the conditions, but the high powered transmitter from their control facilities are quite easy to pick up. Here is a recording of Magadan Radio taken from my archive. The Boeing 787 returned to Seattle after it’s first international trip to the 2010 Farnborough International Airshow. I just happened to dial in Boeing Radio on 11306 kHz as BOE787 was flying over Canada on it’s way back home.